Seeing the number of novels and mysteries I read and review every week, some of you may have forgotten that I’m also an Eastern Orthodox Christian, and as such I try to nourish my faith daily by reading, slowly, and meditating with some Orthodox books. I have already mentioned this book some time ago, when I finished reading volume 2. 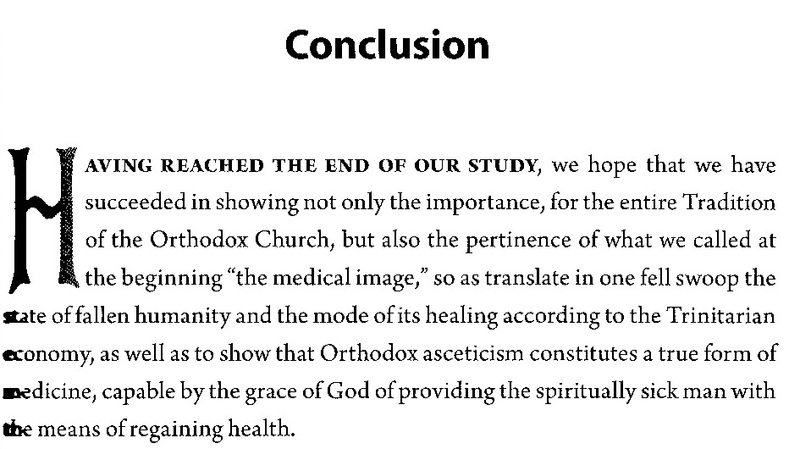 I encourage you to go back to that post to see the table of contents of the 3 volumes, to see what the author is doing, which is, as the subtitle says: An Introduction to the Ascetic Tradition of the Eastern Church. I read this book in French a while ago (in the French edition, it is all in one volume), but it being probably the best book/fresco presenting the whole of Orthodox spirituality/theology (we don’t make that separation in Orthodoxy), I thought it would be good to re-read it in English as it was finally recently published. 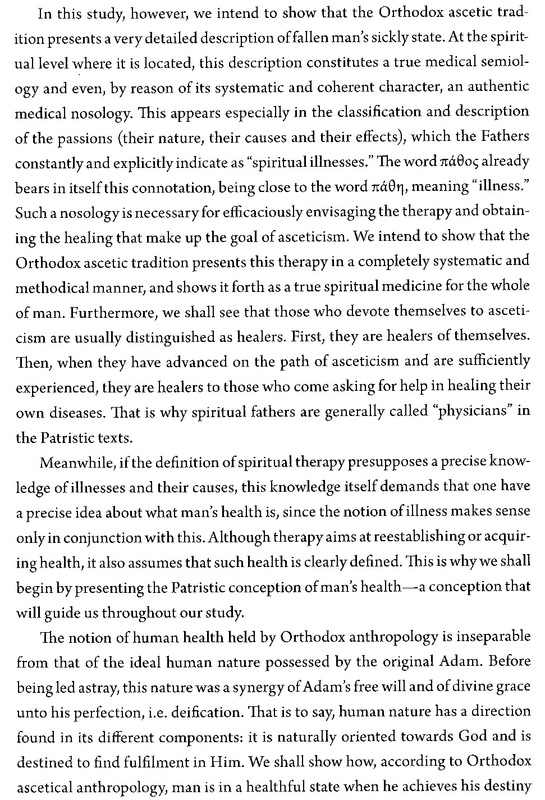 The book is deeply rooted in Patristics and is very accessible. Only a couple of times I thought the translation was a bit weird in the choice of the construction of the English sentence. I would like to give you here 2 excerpts to give you a better idea of the richness of the book. It may offer to some of you not familiar with Orthodoxy a refreshing view of Christian ideas. Remember that the Orthodox faith is actually the faith of the very first Christians, so nothing esoteric here, just the opposite, alas lost for many after a few centuries in the Western world. 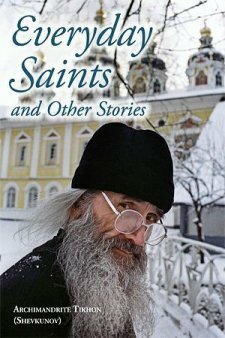 Another big fat book, with 490 pages, but very easy to read, presenting mostly the life of group of young modern Russian men who decided to become monks. There are some beautiful characters, and they illustrate the beauty of Orthodox qualities in daily life. Some stories are actually quite funny. I didn’t find the book as deep as I expected, but I think this is not the point. Rather, the goal seems to show that it is possible to be an Orthodox Christian today and be happy, even when one chooses to embrace monastic life, and I’m not going to contradict that! DOES ANY IDEA HERE PRESENTED APPEAL TO YOU? This entry was posted in foreign, Monastic Spirituality, Non-Fiction, Orthodoxy, Quotations, Religion and tagged Eastern Orthodoxy, Jean-Claude Larchet, salvation, Tikhon Shevkunov by WordsAndPeace. Bookmark the permalink. Thanks for the introduction to these books. We have a bookstore close to us that may carry these. I have no idea what to choose when it come to Eastern Orthodoxy, so it’s helpful to have some guidance! Thanks! I’ve added both to my Amazon cart and if I can’t find them at my bookstore, I’ll at least know where I can buy them. 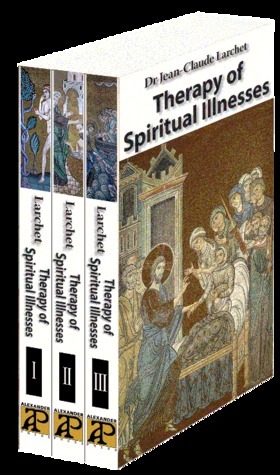 The Larchet books will take more digging.